Catharine Rowland and David Rowland. NO. l450--In the Circuit Court for Washington County, sitting as a Court of Equity. —Ordered by the Clerk of said Court this 28th day of August, 1862, that the Auditor’s Report and Account No. 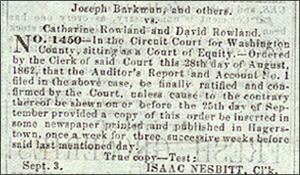 1 filed in the above case, be finally ratified and confirmed by the Court, unless cause to the contrary thereof be shewn on or before the 25th day of September provided a copy of this order be inserted in some newspaper printed and published in Hagerstown, once a week for three successive weeks before said last mentioned day.